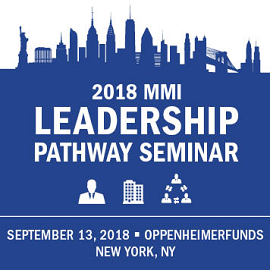 For the third year in a row, the MMI Leadership Pathway Seminar will pair next-generation investment advisory solutions leaders with industry veterans to discuss the future of the industry and how you can position yourself for career success. The Seminar is planned by participants in MMI's Leadership Pathway program -- a by-application program that recognizes the industry's up-and-coming leaders -- and it will cover timely topics from the participants’ unique perspective. You're invited to join the participants, many of whom will be speaking alongside industry leaders, for this highly interactive and engaging event. A keynote presentation by Amy Wolff, Tedx Speaker Coach, who will share proven leadership communication and presentation skills. An introduction to Design Thinking, a new and innovative problem-solving solution, followed by a working session where you will put the concept and techniques learned to a practical test. Interactive breakout sessions -- a crowd favorite each year -- featuring group discussions on such timely topics as the Utilization of Technology for Personal Productivity, Strategies to Advance Your Career, The RIA Opportunity, and Navigating the Evolution of Advice. An “all-star” panel of industry leaders offering perspective on their non-traditional career paths and, looking back, what they wish they had known earlier in their careers. The Leadership Pathway Seminar is truly a one-of-a-kind experience -- a rare opportunity for tomorrow’s industry leaders to connect with and learn from the leaders of yesterday and today. Space is limited, so register now to secure your seat at the event. For more information on the Seminar, contact MMI at (646) 868-8500 or events@mminst.org. In this presentation, Ms. Meehan will present ReFRAME, a neuroscience-based approach that enables more mindful and effective communications. Her starting point is that organizations are constantly threatened by economic challenges, low sales, turnover, global competition, and organizational changes. During times of change and uncertainty, employees often feel threatened, which creates a sense of disengagement. To address these fears many leaders and change agents have learned the importance of repeatedly communicating to all, which is essential. But the big question is how is the information that is communicated being framed? Is the delivery of the communications creating a bigger threat response or are the leaders communicating in a way that the message can be safely received and positively activated upon? ReFRAME, a term that refers to how we “frame” important communications, provides a framework for creating engagement. This session is designed to help you establish new relationships and swap information and ideas. We have identified what might be classified as four industry “challenges.” The goal of this session is to look at them in a new light and reframe them as opportunities. Seminar participants will rotate from station to station to learn what others are doing or thinking around each topic. Three inspirational industry leaders will share their personal career journeys – their proudest achievements and biggest challenges, surprises and lessons along the way, what they wish they had known earlier in their careers, and why the conventional path is not always the smartest. Design Thinking – a human-centered, solutions-based approach to problem solving – has been adopted by some of the world’s most prominent brands and is now being taught at leading universities around the world. This session will provide a tutorial on the phases of Design Thinking and why organizations are increasingly turning to this concept as a way to solve complex problems. Attendees will apply the principals of Design Thinking to brainstorm a common industry challenge and identify alternative strategies and creative solutions. Amy Wolff is a highly-rated event speaker, senior trainer, and executive coach. Her passion, practical insights, and highly interactive sessions have added a unique flavor to corporate events, mixers, sales conferences, and breakout session offerings all around the globe. In addition to event speaking, small group workshops, and one-on-one coaching, Amy is also a speaker coach for TEDxPortland, one of the top five TEDx organizations in the world. The Seminar represents a unique opportunity to build brand awareness with emerging industry leaders, showcase your firm's offerings, and make new connections. A limited number of premium sponsorship packages are available. Do you have a colleague or friend who is interested in the MMI Leadership Pathway program? Bring him/her with you! Once you register at the $395 rate, you are eligible to receive a discount code for your guest. The discount code is limited to two guests per attendee. Attendees should call MMI at ​(646) 868-8500 to receive the discount code. All cancellations are subject to a $50 cancellation fee. Full refunds minus the $50 cancellation fee will be granted for cancellation requests received prior to 5:00 PM ET on Wednesday, September 5, 2018. After that time, no refunds will be granted. Your registration can be transferred to another individual at your firm without penalty. To cancel or transfer your registration, please contact MMI at (646) 868-8500. The following hotels are suggested options near the Seminar (located at 225 Liberty Street, New York, NY).